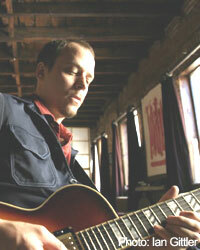 Impressive recordings and mesmerizing live performances have sealed Kurt Rosenwinkel's reputation as one of the most innovative jazz guitar players and composers on the current scene. Raised in Philadelphia by musically adventurous parents, both accomplished pianists, Kurt studied piano from the age of nine and first took up guitar at twelve. He played both instruments for a time and was leaning toward piano before settling on guitar late in high school. After high school, he went on to study guitar at Berklee School of Music and toured and recorded with Gary Burton, Joshua Redman and others before establishing himself as a headliner. After six CDs as a leader, including four on Verve, Kurt recently launched his own label and is releasing his next CD. Kurt lives in Switzerland with his wife and their two young sons. Includes an exciting collection of Kurt Rosenwinkel's compositions and solo transcriptions! The solo transcriptions are from the CD "Deep Song" and the compositions were selected from songs spanning the last 15 years. Compositions and solo transcriptions include: "Brooklyn Sometimes, Cake (Gershwin /Rosenwinkel), The Cloister, The Cross, Gesture (Lester), Synthetics, Use Of Light, A Shifting Design, Cubism, East Coast Love Affair, Minor Blues, Our Secret World, Path Of The Heart, Zhivago". Impressive recordings and mesmerizing live performances have sealed jazz guitarist Kurt Rosenwinkel�s reputation as one of the most innovative players and composers on the current scene! This new publication is of the highly renowned live recording "East Coast Love Affair" and features note for note transcriptions of Kurt�s solos of all eight tunes from the album. Each solo is analyzed and information is presented to help the player understand what Kurt is doing harmonically in each piece. Kurt Rosenwinkel Plays "East Coast Love Affair"